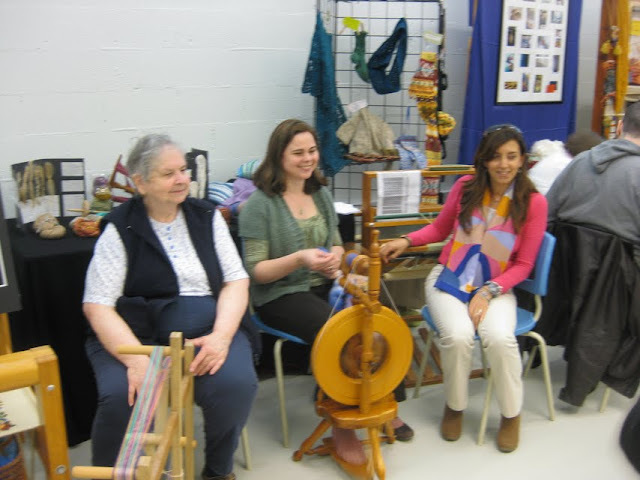 Our guild, the Oakville Handweavers & Spinners jumped right into the mix for the town’s grand opening of the Queen Elizabeth Park Cultural & Community Centre on Saturday, March 24th. It was great to demonstrate with all the other fiber arts groups in Room 040, and even have new members join! Our 100″ loom not only gets to see the light of day after years of no love in basements but it also makes for a screaming display. Do you see the weaver pictured in the photo montage there? That’s Judith Hay. Ixchel took this shot of Judith inkle loom weaving at the opening. I sat next to Judith. As usual the public fell in love with my Wee Peggy wheel. The kids were blown away by just touching the dyed top from Schafenfreude Fibers! We had a good story board of fleece to finished objects on the table behind me. I put my cup of spindles far from any hands and within sight! The other end of our spinning display had a few of my hand-spun knits. The Estonian-inspired colourwork pieces are by Elizabeth-Anne. We also had baskets with different fleeces, and more yarn. The fleece is from my stash: Black Welsh Mountain lamb, the Icelandic ewe, Phoebe & the Romney lamb, Buttercup. A few of our weavers are also members of Ixchel’s Tapestry Studio. Their display was so vibrant! 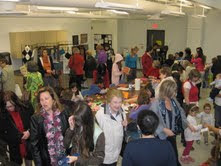 We had a steady stream of people in the room, and it was a great day of getting together with samples of our work. I think it got quite a few people interested, and can’t wait to see the Guild grow. Many thanks to Ixchel for giving me permission to use some of her photos for my post! 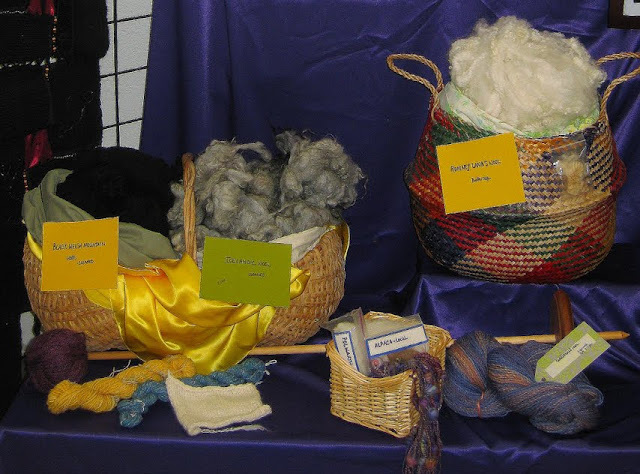 Categories: Spinning Guild | Tags: handspun yarn, socializing, Spinning | Permalink. My week in a nutshell: busy & adult-like. How? Well, it’s easier to live in the moment & get things done when you have a trip looking forward to… Thank you Air Jamaica for the fire sale on Toronto ↔ Kingston tickets. DH will have to work but I was able to take advantage & cannot wait! The up-shot is that I realized how much I should get done before leaving. Please excuse the safety pins… I was too tired to get up & hunt for my extra stitch markers. This merino is a 3-ply laceweight. Since 1 skein was wonky in the plying stage, I am going to use BFL lace wool (2 ply, I think) for the border. My lace expert friend from the Wool Bin group is helping me work out a plan – thanks T! While the lace waits for me to spin a border, I moved right on to knitting what was actually 192 yds of that California Red wool yarn. It was great spinning but a pain to find a suitable pattern. Small amount of quite frankly itchy 2-ply wool. Last Saturday got sucked into a major project search… eventually, I came accross Julesy’s 2005 massively popular Anthropologie Capelet. Great! A shrug. I could use a shrug! I felt like the Yoda of yarn as I got the whole thing done with maybe 1″ to spare. Yeah right. Well, there is a FO shrug but it won’t be fitting me this side of age 12. While I swallow that hard truth, I will show you a picture of a tulip from the back yard. Beautiful bloom. It would be wrong to give a child an itchy wool shrug, right? Like the purple-themed post today? There’s also a bit more on another bobbin. It’s 2-ply & spun on the loaner Spinolution Mach II wheel. I’d like to knit it up into a cowl/ moebius scarf… in fairly short order. 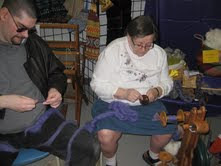 To explain this sudden rush to knit my hand-spun yarn… I’d like to have some items for my guild’s display at the For the Love of the Arts Festival on May 16th. The info for that event is buried on the web here. After that it’s away for the trip, man! Categories: In the Pipeline, Spinning Guild, Stash in; Stash out, What I'm up to | Tags: Corriedale wool, handspun yarn, lace, Merino wool, shrug, Spinning | Permalink. Bad hair days. Deep sigh. It’s not frizz but roots. The infernal gray roots. Growing like there’s no tomorrow & harder to ‘hide’. I’m getting sick of colouring, and so yesterday, I took matters in hand. Literally. Because sometimes a grown woman just needs a headband. May I recommend Molly’s Headband by Pam Allen. Free with IK strings attached here. Don’t need much in the way of skills or can-do attitude. The Fix took next-to-zero Rowan Calmer yarn, and what – 3 hours tops? In just 1 episode of The View, and a fair amount of Tiger Woods coverage with some Helena Geurgis toppling news, I had it done. It was an otherwise busy day. No mods to the pattern on this one but I did go down to 4.0 mm needles. A tight gauge to counteract any stretch from my big ‘ead + a mostly cotton yarn. And I chose the mostly cotton yarn because spring is sprung & I want to wear it nowww. And so, with that off my chest, I have returned to knitting with my handspun. This might end up being a micro shawlette but hey! I couldn’t resist using my merino 3-ply for the 198 yards of Heaven pattern by Christy Verity. It’s designed for a heavier yarn but I wanted to try with this anyhow. Sunday will be another spin-in with the good people at The Fibre Garden in Jordan. These spin-ins are (to quote Forrest’s Mum) like a box of chocolates – you never know what you’re gonna get. Spinners reserve their spots with John & Alan privately. I like that! Categories: Fairs & Fiber Festivals, Finished & in the wide world, Spinning, Spinning Guild, What I'm up to | Tags: cotton yarn, handspun yarn, headband, Merino wool, triangle shawl | Permalink. I had a change of heart on the sock front. Last time I posted, there was a cuff+ of the Sandalwood Socks by Caitlin Stevens. Well, that idea got scrapped when I realized how much chart-squinting was involved. And do you know what the bad part is? I’m not sure how to fix it. A search for online tutorials is in my future. For now, the sock waits while I go for long walks with the Tobster. On Sunday, I drove out to Jordan Village for the Fibre Garden’s spin-in. Bad weather cleared for an easy drive with Miss Peggy on my backseat. It was great to see John, Alan & Rusty (super-friendly dog) again, partake of their cookies & coffee, and meet new spinners. BTW – Joy, I saw your old Louet IRL! Good day of spinning on the Peggy & also getting brave enough to try out the store’s Majacraft Rose. All with the same Coopworth roving. After spinning, I also got some cream Polwarth roving. Monday was even better because that’s when I spoke with Miss Peggy’s owner, and we agreed that I could buy her wheel. Naturally, what with the mishapen sock heel & the “new” wheel, I had to spin. About 15 mins into this happy state, I pulled a piece of the Coopworth fibre & saw the pest – a clothes moth. Just chilling. Cripes! My BFL spindling is affected but I am spinning the new Polwarth. Polwarth, mmmmm. I have been busy with weekday spinning meet-ups as well. It’s amazing how generous each spinner is with me. They give of their time, offer their equipment, and are helping to connect me with others. Coming from teaching myself into the community has been a great experience. Lots of encouragement & feedback. Yesterday, I not only got to try a Lendrum DT & a Majacraft Little Gem but I left with tips, and even a copy of Fibre Focus. Just seeing other, more advanced spinning styles is eye-opening. Reminds me of the Jamaican place name for a mineral spring – Milk River Bath. Here’s a newspaper article if you want to know more: (newspaper linky). Which, in turn reminds me that I want to go there someday soon! Tomorrow, is the Spinning/ Weaving Guild meeting, so the inspiration won’t stop! I am willing the moth & its kin to die. The frozen Coopworth roving will go out in the garbage. It’s not worth the risk. Categories: Getting the knack, Spinning, Spinning Guild, Things Jamaican | Tags: clothes moth, Flora, Frogging, Polwarth wool, Sock, Spinning, Techniques | Permalink. That’s a honking ball when you consider that it’s all BFL laceweight. I started the second single last night. It’s wee & sturdy but not an airplane traveler. Great on the backseat of my car. This all begs the aching question: but will I even fly with a wheel?! Am I thinking like a collector here? Can I afford to? My first guide in all of this was Abby Franquemont’s oft-linked article Choosing your First Spinning Wheel. The title alone is so reassuring. She explores the modern starter wheel options & comes down in favour of the Majacraft Pioneer. Well, I’m lucky enough to know of one that’s for sale. In the spirit of being sensible, I have borrowed that Pioneer. Toby fights back for his morning sun. It spins very smoothly, and treadling is a breeze. That’s my Coopworth on the bobbin. I was swallowing the basic looks/ mdf construction when DH waltzes in & pans it straightaway. Which really was the only excuse I needed to seriously wonder if I liked the delta orifice, etc. On the other hand, the used-to-me price is reasonable, and Abby made v. good points. But. I have to say: it lacks a back maiden. Where would I put my spinning angel? To be honest, the Pioneer is not a strong contender right now. My other idea is to keep Miss Peggy & get a Lendrum in the near-term. Lendrums are Canadian made, maple, good all-round wheels. A guild member has offered to let me try hers out next week. I will be looking to see if the angle on the drive wheel bothers me. If you don’t know, Lendrums tip forward. That could be an issue because I’m on the shorter side of life. If I have to give Miss Peggy back then I would want to go in above entry level. I think that a Schacht Matchless DT + accessories would be a good trade-off. There’s one in Ohio with a sale pending. Do I think it’s worth a drive there & back? Yes, I do. It’s been a wild whirl to quote this BF-posted poster. 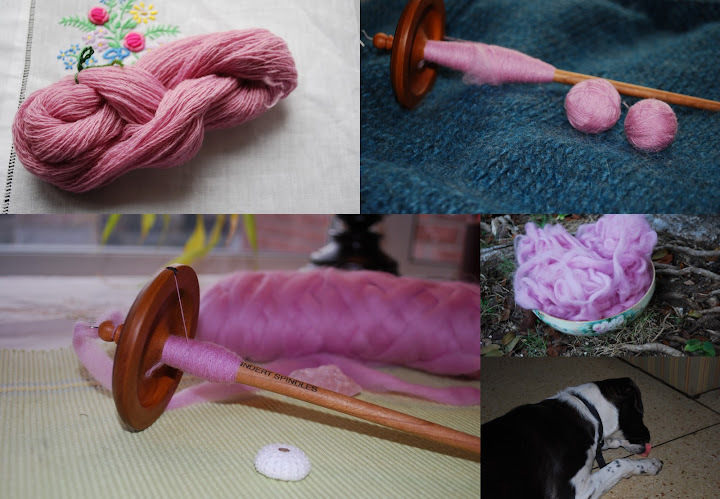 Categories: Spinning, Spinning Guild | Tags: BFL wool, drop spindle, Equipment, lace, Majacraft Pioneer wheel, Wee Peggy wheel | Permalink. It’s been a slow Monday morning & I’m late for a knitting meet-up but just want to quickly point over here. It’s a post on my Handweaving & Spinning Guild’s blog about member Stella Tang’s wonderful presentation on her handwoven necklaces last Friday. Stella explained her technique to the Guild, and as you can see from the pictures, she also brought beautiful examples of her work at various stages of completion. She prepares a hand-held loom with galvanized pins, and warp threads. Once the design and loom are in place, Stella then weaves with a tapestry needle and stunning threads, incorporating beads. Joining the beads within the body of the necklace is the main complicating factor. She has experimented with many interesting materials, and her compositions range from (relatively) simple to complex. So interesting! And if I don’t get a move on, I’ll be really late for this meet-up! Categories: Spinning Guild | Tags: Techniques | Permalink.